A SpaceX Dragon cargo ship approaches the International Space Station to delivery nearly 3 tons of supplies on July 2, 2018 in this view from a station camera. It is the Dragon's second trip to the space station. A SpaceX Dragon cargo ship arrived at the International Space Station early Monday (July 2) carrying nearly 3 tons of supplies for astronauts, including super-caffeinated coffee, Texas blueberries and an extra special treat: ice cream bars. The Dragon, which astronauts captured using a robotic arm at about 6:54 a.m. EDT (1054 GMT), is carrying a batch of Death Wish Coffee — billed as the "world's strongest coffee" — for astronauts to enjoy in orbit. "Food's a huge psychological benefit," Shireman said. "When you're living in a closed environment, you're basically eating the same menu every 8 or 9 days, and then you repeat. So, having something different is a real treat." The Texas blueberries are part of a traditional load of fresh fruit and vegetables that make up a fraction of the 5,900 lbs. (2,700 kilograms) of supplies hauled to the space station for NASA on the Dragon spacecraft. But the ice cream, Shireman said, is extra special. "Don't tell the crew, but there are some frozen treats that will be up there as well, a few ice cream bars," he said. "Very few, unfortunately, because most of our frozen space is for science." In fact, 3,874 lbs. (1,757 kg) of the cargo aboard Dragon — more than half of its supplies — are dedicated to science. That gear includes new plants to grow, like lettuce and wasabi mustard, as well as an experiment to test how algae could serve as a potential food source and life support boost on long space missions. Death Wish Coffee freeze-dried coffee packets as prepared for the International Space Station Expedition 56 crew. One microgravity experiment will test the effectiveness of cancer-treatment drugs, while another piece of hardware — NASA's Ecosystem Spaceborne Thermal Radiometer Experiment on Space Station (or ECOSTRESS) — will be mounted to the station's exterior to track how plants on Earth respond to heat stress and lack of water. And finally, there's the Crew Interactive Mobile Companion (CIMON), the first artificial intelligence robot to visit the space station. CIMON is a nearly spherical droid built for the German space agency (DLR) by Netherlands-based aerospace company Airbus. It is powered by IBM's Watson system and can see, hear and talk with astronauts. German astronaut Alexander Gerst of the European Space Agency will test how CIMON can be used to foster human-robot cooperation in space as part of the DLR experiment. A small robot named CIMON (short for "Crew Interactive Mobile Companion") will arrive at the International Space Station on July 2, 2018. CIMON is the first robot with artificial intelligence ever to fly to space, project team members said. Today's Dragon arrival marked SpaceX's 15th delivery mission to the space station for NASA under a multibillion-dollar resupply contract. The Dragon used on this flight has visited the space station before, in 2016, to deliver NASA supplies on SpaceX's CRS-9 mission. The first stage of the Falcon 9 rocket used to launch Dragon also flew in space before. SpaceX used it to launch NASA's TESS exoplanet mission in April. Eventually, SpaceX hopes to fly Dragon vehicles at least three times as part of its reusable rocket and spacecraft program, according to Jessica Jensen, the company's Dragon mission management director. Dragon will stay linked to the space station for about a month before returning to Earth filled with science experiment results and other gear. NASA officials said its arrival today marked the 30th time astronauts have captured a visiting spacecraft with the station's Canadarm2 robotic arm, which was built by the Canadian Space Agency. 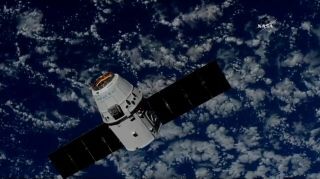 So, it was fitting, the space agency said, that Dragon and the space station were sailing high over Quebec, Canada when NASA astronauts Ricky Arnold and Drew Feustel grappled the spacecraft with the arm. After all, NASA officials said, yesterday was Canada Day. "Looking forward to some really exciting weeks ahead as we unload the science and get started on some great experiments," Feustel told Mission Control. The space station's current Expedition 56 crew includes Feustel, Arnold, Gerst, NASA astronaut Serena Serena Auñón-Chancellor and Russian cosmonauts Oleg Artemyev and Sergei Prokopev. Feustel is commanding the six-month mission. "You guys made it look easy," spacecraft communicator Pooja Jesrani radioed the crew from Mission Control at NASA's Johnson Space Center in Houston.